It was not long ago that ciders were far and few between, but now, ciders are popping up everywhere across the country. From dry tiny bubble-style (like a fine French Champagne) to bold and sassy, spiced (chai cider – yes please) and fruit-forward (think pear and raspberry). There’s something for everyone’s tastes. Here in the northwest, we love our ciders! From restaurant menus to pubs to the shelves lined at your favorite grocer, ciders are everywhere! 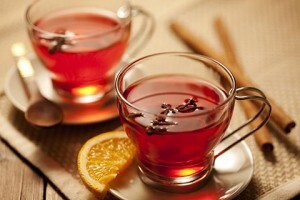 grapefruit and pomegranate juices, and chai cider! And with Thanksgiving coming, why not consider serving a hard cider with your holiday bird. Think a dryer style apple cider; it’s a great alternative to white wine. Hosting a party? Mix up a batch of my Pear & Blackberry Sangria – sure to be a crowd favorite! Or how about putting together a cider tasting! Ask your guests to each bring a different cider. Put a brown bag over each one and tie at the top. Then give each guest 3 ribbons to hang around the top of their favorites, taste, unveil, and crown the cider winners. How fun is that! Blackberries can be switched out for raspberries or strawberries depending upon what’s peak of season at your local market. In a blender cup combine the water, lemon juice and blackberries. Process until smooth. Then strain through a fine mesh strainer and discard solids. Add the honey, orange juice and brandy and stir until honey is dissolved. Refrigerate for up to 2 days. #AquavitWeek is upon us and for those of you that have never tried this delicious Scandinavian spirit – it’s time! 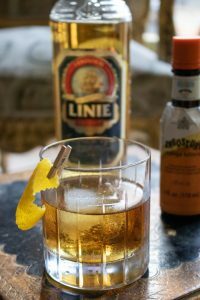 I suggest for your first bottle to get Linie, a Norwegian-style aquavit, which means it’s made from a neutral potato base spirit and barrel aged, giving it a slightly nutty back note. Linie is distilled with caraway (the classic flavor note – just like juniper is to gin), star anise, and other botanicals. It’s aged for a year in sherry barrels in Norway, then takes a four month journey at sea from Oslo to Australia and back. The seventh annual Aquavit Week returns for a celebration of the signature spirit of the Nordics from November 4th to 10th. To learn more and to find out where to sip on an inspired Aquavit cocktail go to www.AquavitWeek.com. Toast to Aquavit Week with a Katerina cocktail! The Katerina cocktail is a spirit forward drink that mixes so many of my favorite potables; botanical gin, the delicious aged and spice notes of Linie aquavit, the slight bitter and sweet of the vermouth – sparked with an aromatic citrus punch from Angostura orange bitters and the bright finish of lemon peel oil. Measure the Linie Aquavit, Sipsmith Gin, and sweet vermouth into a mixing glass. Dash in the Angostura bitters. Fill mixing glass three-quarters with ice and stir with a cocktail spoon for about 20-30 seconds. Strain into a rocks glass over a large block ice cube. Express lemon oil over cocktail, twist and add to drink. And raise your glass to #AquavitWeek! Halloween is coming up and it’s not just for kids. It’s also a chance for adults to indulge in the fun – haunted houses, spooky costumes, and of course, parties! And what’s a Halloween party without something spooky to sip on? 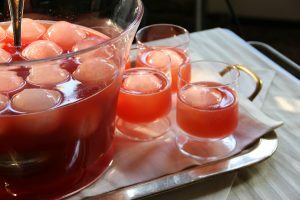 To get you in the spirit, try a fun cocktail like the Blood Sucker – vodka, BLOOD orange juice or syrup, and fresh lemon sour, shaken, and then topped with splash of wine. And to stick with the vampire theme, go to a costume store or check out Amazon for glow-in-the-dark fangs – -whaa haa haa! For a monster mash, make a batch of my Cauldron Punch. It mixes rum, blackberry puree, fresh juices, and is topped with sparkling berry water. For an added fun, top with a float of blue curacao and stick in a skeleton arm swizzle stick – perfect for a ghoulish good time. Don’t think of it as bad luck if my Black Cat Old Fashioned crosses your path. 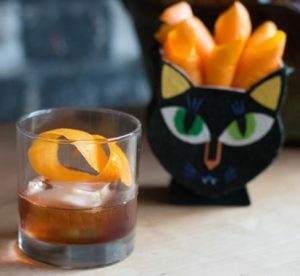 No, this spin on a classic Old Fashioned cocktail mixes bourbon, mescal, homemade Orange & Black Coffee Syrup, and a few dashes of chocolate bitters. 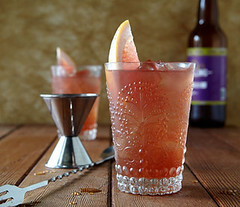 Measure vodka, blood orange, and Fresh Lemon Elixir into a cocktail shaker. Fill with ice, cap, and shake vigorously. Pour into a tall glass, adding more ice if necessary. Float red wine. Garnish. Measure rum, puree, juices, lemon and simple syrup into a pitcher. Refrigerate until ready to serve. Right before serving, add LaCroix Berry Sparkling Water to the punch. Serve over ice in goblets. Float with a splash of blue curacao. Garnish with skeleton arm. Measure the bourbon, mezcal, syrup and bitters into a mixing glass. Fill three-quarters full with ice. Stir with a bar spoon until well chilled. Serve strained over a large ice cube in an old fashioned glass. Express the orange peel over the drink to release the oils, twist, and add to the drink. Combine ingredients in a small saucepan. On medium-high heat, bring liquid to a boil, once it has boiled add the sugar and stir to combine well, continue to boil for about 2 minutes. Remove from the heat and steep for 1 hour. Strain and store refrigerated for up to 30 days. 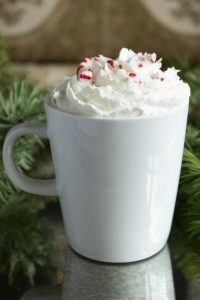 *To make Simple Syrup: combine 1 cup boiling water with 1 cup sugar. Stir until sugar is completely dissolved. Cool and store refrigerated for up to 2 weeks. Lemonades, limeades, fizzy orangeades – summertime and citrus go hand-in hand. Start with the basic template: citrus juice, sugar, and water. Then switch it up a bit. How about Meyer lemon or Key lime juices? Next get creative with water and add some soda water. But think outside of the box and use a flavored soda water – think La Croix or flavored Perrier like fizzy blackberry, sparkling peach, or effervescent blood orange. Instead of making it with traditional cane sugar, sweeten it with organic agave nectar, a unique honey variety like wildflower or buckwheat, or try a touch of maple syrup. You can also change up the ice. Have you heard about the fun butterfly pea tea? It changes color when you mix it with citrus juices. Yes, you can make ice cubes with this for a magical experience that kids of all ages will love! 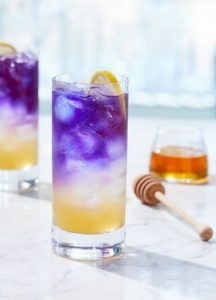 Or craft a delicious drink like a Honey Butterfly Tea Soda! The sweet and tart honey citrus elixir adds flavor and body to this refreshing drink. The colorful brilliant blue butterfly pea tea creates a magical experience when mixed in! Measure the Honey Citrus Elixir into a tall glass. Fill with ice, then add the soda water and top with the tea. Place the tea, ginger and boiling water in a pitcher. Let steep for 15 minutes then strain. Add the honey– stir and let cool to room temperature. Then stir in the lemon juice and refrigerate.